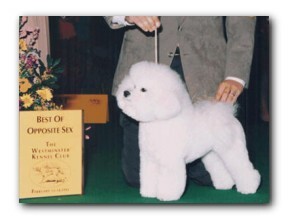 "Trinket" is my very first show dog and the top dog in our household in status and age. She is from Cricket's first breeding (three of the five puppies were shown), and is the leader of the pack- out in front of all the others. She did outstanding in the ring and in the whelping box! She is still an absolute joy to love.